I had lunch yesterday with a former employee who is now a Director of Aquatics and Recreation programming. She was distraught. I could see the tears forming in her eyes. She talked of being ready to quit and simply over it. I can relate. I’ve been there, so many times. We chatted over lunch and I’d like to think she felt better from our strategizing session, but the whole experience got me thinking about some of the struggles being in aquatics leadership. It is so disappointing that a competent and passionate aquatics leader, who wants to do the right thing, is so delusional and beaten down. Man, is it a struggle to try to find the motivation to not only explain what you need to support your operation / programs, but to explain the basics of how aquatics works to someone. Aquatics isn’t like other programs, where you can simply make a cut somewhere and absorb it other places, or cut a program to make up for it. Everything is intertwined to safety. Aquatics professionals have the pressure of justifying every dollar and every cut while still ensuring the safety of their operation. Sometimes our superiors simply don’t understand the impact of their decisions or suggestions. During my lunch, we talked about how she had to explain why lifeguards needed a certification. I immediately rolled my eyes, but I understood the frustration. Justifying and explaining non-negotiable items like lifeguard certifications is hard. It makes a prudent aquatics operator feel like they are being scrutinized for items they have no control over, and even worse incompetent when they can’t figure out a way to get around these requirements. Same goes for code requirements. I remember being in budget meetings and explaining why something needed to happen per the Health Department or State Code, and the looks I received felt like I was being judged for my lack of competence when in reality I had no control over the codes and requirements and had to meet them. I can’t tell you the conversations I’ve had related to lifeguard numbers, positioning, or inservice requirements that falls under this same mindset. She shared how she was in a meeting pitching a reduction in aquatic facility hours to meet the budget requirements and was told okay, you can close the pool during those hours, but you need to keep it open for camps because the pool use had already been scheduled into their program during the week. Um, what? Why can’t camps adjust their schedule?? I’m sure you can relate. My aquatic program financials need to suffer to support your program and it is not reciprocal. Unless you have a boss / superior who understands that having the pool open for camps is the same as having it open for others, then these frustrating conversations continue to happen. I’ve also seen this play out with the struggle between Marketing and Operations. Marketing likes to agree to anything and logistically it is usually the operators worst nightmare or not achievable. Marketing views operations as their support and doesn’t understand how their decisions and promises impact everything. Another conversation we had was about an uneducated Superior’s request to have a facility opened for an all-nighter event. The Aquatics Director protested immediately to explain that this request was simply NOT like renting out a gymnasium or going bowling. The pool had to be staffed with lifeguards and who was going to make sure a lifeguard was awake and attentive at 2am. The risk and liability for that type an event is super high, and is an automatic no for most operators, yet it is still a conversation we have to entertain and battle. Now most aquatics people I’ve met are on their game, so I get it when I hear that they have been asked to chair a new committee, or oversee a new project, or be the liaison with a new department, or represent their boss at a department meeting…the list is endless. Aquatics directors / managers are not viewed with their biggest priority being their time spent on the pool deck and actually supervising their lifeguard staff. In addition, seasonal aquatics operators are often signed up for helping the “hard park” / FEC, or another department, or working on projects that don’t relate to their duties. Now I worked plenty of Halloween events, helped in rides, did hours of maintenance projects, but having a boss who understands the line between helping for a little bit and not being able to prepare for your own area effectively is key. With year round operations this is even harder. It seems so easy that Superiors have no problem pulling Aquatics Directors away from their operations or adding more to their areas of responsibility, the burnout and frustration is logical. 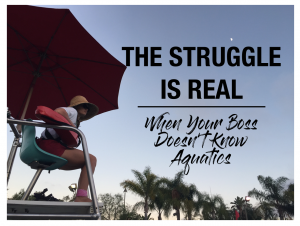 I had a conversation with my new boss one year and he asked me the most annoying question you can get as a seasonal aquatics operator…”So, what do you do in the off-season?” Ugh, really. I joked and said, “You know, take vacation, work on my tan, get massages, do crafts…”. It probably wasn’t the best response, but honestly it is a question asked by people who don’t understand aquatics. He then asked, “So, do you close up the operation until December 31st, and then work on re-opening January 1st?” Clueless. No, I actually start working on the next summer in August before the previous summer is even done. I can’t even tell you the level of frustration dealing with someone who has no idea of your basic job functions and responsibilities. He wasn’t asking the questions to be a jerk, he honestly was clueless, and that is where the battle begins. I have also seen Aquatics Directors forced to spend their time in a guard chair, which really creates a negative cycle. The Director is in the guard chair because of budget cuts or lack of lifeguards which pulls the Director away from their normal functions of managing the operation, providing leadership, making decisions, overseeing safety, recruiting, interviewing and hiring, training staff, and so much more. And with all of these functions not happening, the operation suffers and slowly (or drastically) declines. On occasion, I understand Leadership needing to be in stand to make ends meet, but it shouldn’t be a regular or daily function, if so, there is something bigger wrong with your operation and most likely leadership above the Aquatics Director. I’m sure if you are still reading this you can relate to some or all of these examples, and hopefully these stories give you a picture of what you are experiencing is normal. But being normal does not make it any easier or make you not want to quit or just check out from being tired of fighting the battles. I think this needs to be addressed for the sake of hard working aquatic operators that are being impacted in many operations. It is so frustrating and disappointing that a great Aquatics Director who is passionate and dedicated to our industry wants to give up.